These children live in Tapukwa where our Water for Life Project is beginning to bear fruit. 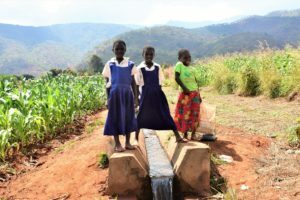 I was there just before Christmas, and it was great to see water flowing in the irrigation scheme – life-giving water because of the power it has to enable two crops to be grown on the land, bringing much needed income to the families which these children come from. While children here in Scotland were making lists for what they would like Santa to bring, these children want basic things, like a chance to go to school, to learn and to grow. Irrigation channels make a great shortcut home from school!